On October 24, 2017 Marsha Salzwedel and Melissa Ploeckelman headed down to Indianapolis, Indiana to represent the National Children’s Center of Rural and Agricultural Health and Safety, The National Farm Medicine Center and, of course, UMASH. 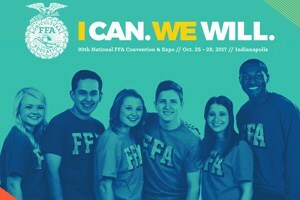 Once arriving in Indy, the streets, buildings and billboards were decorated to the nines to welcome us saying, “I Can, We Will.” After setting up the booth and a good night’s rest we were ready for the FFA members. Starting Wednesday students from all 50 states, Puerto Rico and the Virgin islands came into the safety area to learn about how to stay safe while working on a farm and performing their Supervised Agricultural Experiences (SAE). At our specific booth, each youth filled out a survey to outline who is the most safety conscious on a farm, who is the most vocal about safety and finally the youth’s gender. Then they got to come over to the next table and play jeopardy where they answered questions about NCCRAH’s new Agricultural Youth Work Guidelines. Wednesday we connected with 362 members, advisors and guests; Thursday 509; and Friday we conversed with 296 people. It was a pleasure to meet so many positive and polite teens while having the opportunity to discuss safety with them. We know 33 youth are injured daily on farms. Hopefully with this many conversations that number will go down, even a little bit!